Keep your decks, outdoor dining areas, or pool-side patios shaded with this California Umbrella ALTO 604 SUNBRELLA 2A Venture 6' square push lift umbrella with 1 1/2" matte white aluminum pole. An essential addition to commercial environments, the Venture series offers umbrellas that are created with superior materials and exude a classic, sophisticated appearance. This umbrella features a 1 1/2" thick, double wall matte white aluminum pole with sleek, stainless steel hardware for a robust foundation. Its 1/2" thick, high-density fiberglass ribs bend with the wind without snapping or breaking, yet provide excellent support for the canopy. In addition, the single wind vent allows for sufficient air flow to ensure stability and prevent the umbrella from moving with strong wind gusts. 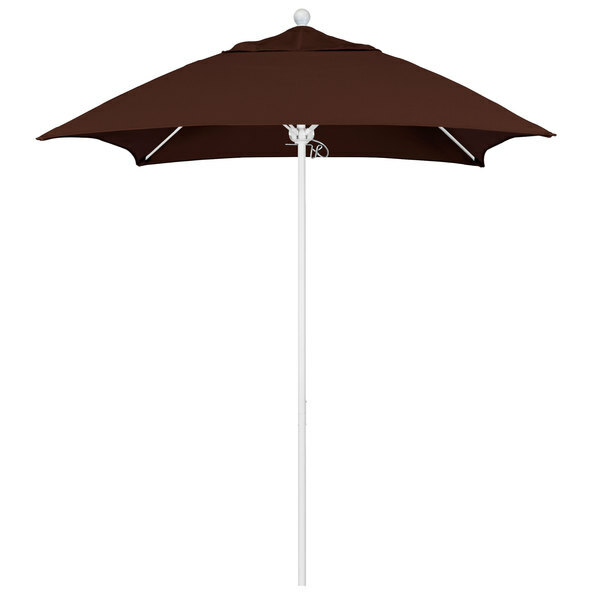 This umbrella's 6' by 6' size has sufficient area coverage, providing multiple guests with relief from the sun's rays. Its push lift also allows staff members to easily open or close the umbrella with a simple push. In comparison to pulley lifts, this style of lift helps keep the canopy undisturbed in high-traffic areas since it eliminates any hanging rope that could encourage tampering. The canopy's Sunbrella 2A fabric is made of 100% solution-dyed acrylic canvas and is specially enhanced to protect more sensitive colors from fading even under the most extreme sun exposure conditions. It will provide a professional look for years to come. Height (to bottom of ribs): 81 1/4"